Machine learning experiments with hyper-parameter selection and parameter servers. Some advanced workloads want to directly manage and mutate state on workers. A task-based framework like Dask can be forced into this kind of workload using long-running-tasks, but it’s an uncomfortable experience. To address this we’ve been adding an experimental Actors framework to Dask alongside the standard task-scheduling system. This provides reduced latencies, removes scheduling overhead, and provides the ability to directly mutate state on a worker, but loses niceties like resilience and diagnostics. Work for Actors is happening in dask/distributed #2133. Many Scikit-Learn-style estimators feature a partial_fit method that enables incremental training on batches of data. This is particularly well suited for systems like Dask array or Dask dataframe, that are built from many batches of Numpy arrays or Pandas dataframes. It’s a nice fit because all of the computational algorithm work is already done in Scikit-Learn, Dask just has to administratively move models around to data and call scikit-learn (or other machine learning models that follow the fit/transform/predict/score API). This approach provides a nice community interface between parallelism and machine learning developers. However, this training is inherently sequential because the model only trains on one batch of data at a time. We’re leaving a lot of processing power on the table. To address this we can combine incremental training with hyper-parameter selection and train several models on the same data at the same time. This is often required anyway, and lets us be more efficient with our computation. However there are many ways to do incremental training with hyper-parameter selection, and the right algorithm likely depends on the problem at hand. This is an active field of research and so it’s hard for a general project like Dask to pick and implement a single method that works well for everyone. There is probably a handful of methods that will be necessary with various options on them. These parameter servers manage the communication of models produced by different workers, and leave the computation to the underlying deep learning library. This is ongoing work. Some of these are also based off of improved dataframe handling features in the upcoming 0.20 release for Scikit-Learn. This work is done by Roman Yurchak, James Bourbeau, Daniel Severo, and Tom Augspurger. Profiling concurrent code is hard. Traditional profilers like CProfile become confused by passing control between all of the different coroutines. This means that we haven’t done a very comprehensive job of profiling and tuning the distributed scheduler and workers. Statistical profilers on the other hand tend to do a bit better. We’ve taken the statistical profiler that we usually use on Dask worker threads (available in the dashboard on the “Profile” tab) and have applied it to the central administrative threads running the Tornado event loop as well. This has highlighted a few issues that we weren’t able to spot before, and should hopefully result in reduced overhead in future releases. There is a new release of Dask-Yarn and the underlying library for managing Yarn jobs, Skein. These include a number of bug-fixes and improved concurrency primitives for YARN applications. The new features are documented here, and were implemented in jcrist/skein #40. Work was done in dask/dask-jobqueue #78 by Ray Bell. The Dask Stories repository holds narrative about how people use Dask. Sameer Lalwani recently added a story about using Dask to model mobile communication networks. It’s worth a read. 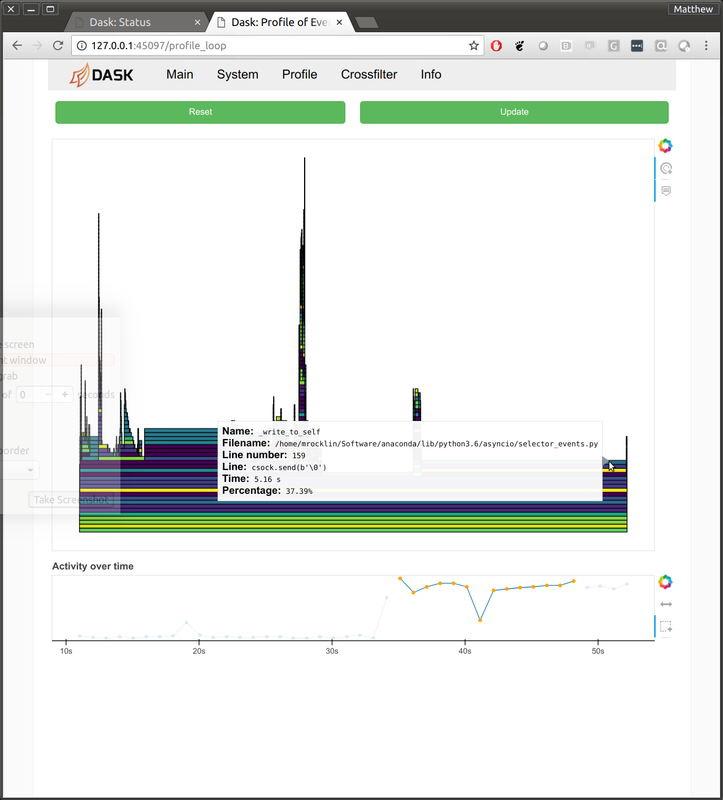 The dask.distributed test suite has been suffering from intermittent failures recently. These are tests that fail very infrequently, and so are hard to catch when writing them, but show up when future unrelated PRs run the test suite on continuous integration and get failures. They add friction to the development process, but are expensive to track down (testing distributed systems is hard).